I have arms…look every one I really have arms! I have a nose. I have ears! My eyes are brown! How absurd would it be if I ran around the city telling people that I had obvious body parts? Pointing out the obvious doesn’t seem to have much glamour or relevance does it? In a similar notion wouldn’t it be odd if I ran around telling people I was seven feet tall or had green eyes. The reality is that I do have a nose and I do have arms, nicely defined if I might add, and am only 5’9” and have brown eyes though. It makes sense that people would be unimpressed with my captain obvious antics, but also confused by my glaring embellishments of height or eye color. Furthermore what sense would it make to boast of something internal and unseen, say, like an abnormally large liver or something of the sorts. Most would scratch their head, laugh, or just walk away in response to me charismatically announcing my enlarged liver. What does it matter to them, it is some unseen, internal aspect that does not affect them. It would be bizarre to anyone that I encountered wouldn’t it? This parallel has become increasingly appropriate for Christianity and faith as I’ve watched and listened to modern environment of society. The more discontent I became with the religious temperature of our society the more I was lead to do something epic and risqué. I approached the beast from behind as it lay to rest in its comfort, I hold the cold steel of a knife to my side with great confidence, and consider the implications of the impending deed. Sounds like quite the dramatic scene doesn’t it? I used to have a large cross and bible verse on the back of my truck. I’m speaking of the day I removed the cross and bible verse from the back window of my truck. As I carefully removed the vinyl from the glass I could not ignore the dilemma of theologies etched into my soul. Was I denying Jesus? Was I denying my faith? What was the reason for the unbraiding of my chariot? What would my friends think of me? Was I doing this just so I could cut people off in traffic with no guilt? I’ve heard so many people opposed and down right furious about removing the ten commandments from judicial buildings and such. I don’t think they belonged there in the first place because it crushes the separation of church and state, but that’s another topic all together. We fight to keep prayer in schools and cry at the thought of the word God being taken out of pledges of allegiance to countries. I typically bring my backpack with me anywhere I go. So much that I’ve had friends call it my man purse because I bring it everywhere with me like a woman does a purse. In my backpack are my bible, lap top, ipod, journal, and whatever book I may be reading at the time. I figure you never know when you will get a moment to read, write, reflect, or use these items. A co-worker asks to borrow my bible one morning. I give it to her without questioning because people have all sorts of agendas and reasons for reading this book. She begins to ask me where she can find certain ideas and principles in the Bible, which finally leads me to ask what she is doing. She was writing a letter to one of our senators who had voted yes on a certain law or motion. My natural response was, “Is he a Christian?” Her response, “I don’t know.” She gingerly continues to work on writing her letter full of scripture passages. My thoughts go something like this… What if I received a letter from a stranger quoting a book I don’t know or believe or interprets the same way they do, offering me instructions based o that book? How would I feel if Muslims were fighting to have their public prayers spoken in public school. What if there were something I didn’t believe that someone was pushing on me? I’d be highly offended and feel a little oppressed to tell the truth. Why is it that we do not consider this more often though? Painfully my mind toils pondering if Jesus really meant for things to be the way they are. It seems to me as I have read the Bible and Jesus’ ministry that He was a lot more concerned with our interior changing. He seemed to be concerned with something unseen and internal changing. Seems to me Jesus was more concerned with changing the unseen. Seems to me that He knew the implications of this change would be reflected externally in good time. What good does it do to brag about something people cannot see? The removal of my external expression of faith on my automobile had more to do with respecting others and not being so irrelevant to think an internal truth should be boasted about freely. This is not to say one should not speak of their faith. We will get there shortly. I don’t make it a practice to watch men in spandex for several hours or read about them, but there is an exception I’ve made once. 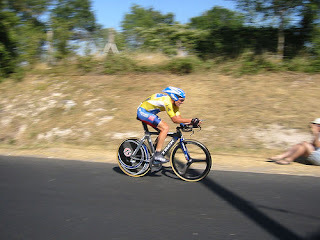 I was very fascinated by Lance Armstrong and his many victories of Tour de France. Lance Armstrong’s success is due in large part to his enlarged heart. This unseen attribute makes itself very known by it’s extension of application or action. His heart pumps more blood than the normal heart because of it’s size. This gives Lance Armstrong the keen advantage of have longer endurance and strength than most of his competitors. If he were a librarian in North Dakota somewhere his enlarged heart would mean nothing. In North Dakota he would be a freak of nature to run around bragging about his enlarged heart. How did the general public find out about his heart condition? His winning so interested people that we wanted to dig deeper into the reason behind his successes. Because of that we found out through tests and such he had an abnormally large heart. Quackers and Amish seem to have captured my heart recently. While I don’t have the manliness to grow a gnarly beard like my Amish friends or motivation to build everything by hand or not own or drive a vehicle I admire their ethics and principles in practice. While I love progressive music too much to abandon my likes for the Quacker hymns I do applaud their lifestyles. They are people of simplicity. They have great faith, but not people you will ever see or hear amongst the chatter of the world. Their voices are steady yet silent. Their faith is great yet they do not raise flags and banners to advertise it. I know many people who raise these banners and flags of their faith, but are some of the most miserable folks I’ve met. The liberation Jesus promised doesn’t seem to be in them at all. They seem to be like I would be to others speaking of my seven foot frame or green eyes. Sure, they can speak eloquently, but what people see doesn’t match what they hear, thus becoming irrelevant or foolish. As crazy as it sounds to rant and rave about having arms and pointing out obvious things most Christians run around telling of their faith and such and they will either get one of the above-mentioned reactions. They either seem crazy for pointing out obvious things or ignorant for boasting of characteristics that they do not posses. Doesn’t it seem much more practical to allow the internal to reflect itself naturally in life, thus creating curiosity, and finally creating dialogue? I beg you now friends, put down your flags, put away your megaphones, dispose of your cross t-shirts, and trust that the Holy Spirit inside of you will doing the speaking naturally and doesn’t need your help. May you trust your internal to become external. May you be patient and not allow your mouth to precede your heart. May your lifestyle speak more of your faith than any eloquent monologue ever could. May you live the lifestyle of faith Jesus taught and lived, one of simplicity, peace, and patience. May you live your life from the inside out.